The hospitality landscape is changing, and you want your business to be on the cutting edge of the latest trends. Casual yet stylish comfort is in, including when it comes to accommodating children. Service-oriented environments have traditionally been rife with ugly, mass-produced furniture designed more for the sake of uniformity and ease of maintenance than to inspire and relax guests. That practice is shifting, however, and you can boost your reputation as well as the impression you make on your clientele by simply adding something a little different to the mix. When you think of hotel lobbies, what comes to mind is furniture in garish, and typically dark, patterns, in designs that are not very warm or structurally inviting. Durable and hygienic bean bags can bring a whole new feel to your common areas, offering a relaxing and unique area in which your guests feel at home and welcomed. You want your clients to talk about their experience long after they depart your facility, and creating soft furniture groupings where they can kick back and read, work on their computer, or visit with others in their group is a simple yet effective way to inspire them to share how pleased they were with the accommodations. Another memorable touch is having these comfy, versatile furniture pieces available to be brought to the room of guests with children so they can feel more at home in a strange place. Hard plastic beach chairs are the standard in many resort facilities, yet there are so many reasons to go with something a little more unconventional. Furnish your poolside or beach area with colourful, indulgent, waterproof bean bags and watch your guests unwind – and tell others about their amazing experience every chance they get. 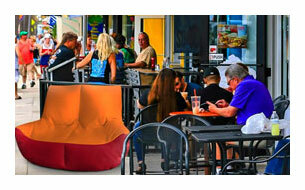 Why use bean bags as your facility’s outdoor furniture of choice? They’re soft – No hard arms or sharp edges to get in the way of total relaxation. They’re colourful – Choose from a dizzying array of colour combinations, creating as casual or as sophisticated a look as you need for your resort’s theme. They’re fun and original – You want your clients to return, and you want them to share the details of their stay with other potential guests. Bean bag chairs and loungers leave an impression, and serve as one of those minor yet noticeable details which make the difference between you and the competing resort. 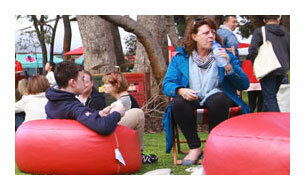 They’re clean – Bliss Bean Bags are anti-microbial and a breeze to clean. And because they’re waterproof and come with a lifetime warranty, your investment is protected. In today’s competitive industry, you want to embrace unique ways to make your business stand out. Bliss Bean Bags makes that an easy task, with a wide range of shapes, sizes, and colours which bring a personal touch to any hospitality environment.